With so much anticipation of what the new Stirling City Deal will bring, a look at past developments, like Stirling Futureworld, launched in July 1984, is timely. The Futureworld plans were big and breath-taking, and launched with a style and on a scale which rarely had been seen in Scotland before. The Stirling Smith has a copy of the jumbo – sized presentation pack with its fine illustrations, photographs, charts, maps and ‘100 actions’. This was accompanied by a 12 page colour summary, a car sticker proclaiming ‘I can see the Future’ and a half hour video cassette presentation fronted by journalist and historian Magnus Magnusson. 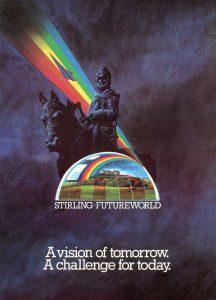 Futureworld was promoted everywhere, using the distinctive logo of the Bannockburn Bruce statue backed by a rainbow and with a glass domed Stirling Castle beneath. Stirling reached out to many other agencies and set up partnerships to bring many of the aims to fruition. The Top of the Town was the main designated improvement area. With the High School, Erskine Marykirk and Detention Barracks sitting empty, and the Smith in poor condition, something had to be done. Futureworld brought about a flowering at the Top of the Town and Stirling District Council adopted the logo as its own for a ten year period.